With the advent of Kindle, Nook, and the Apple iPad, many bibliophiles are slowly moving away from paperbacks and hardbound books. Earlier a book lover used to spend hours looking for that perfect book in a rustic library, now they just search for their favorite title on Amazon.com and they can start reading in minutes. Of course, not all are happy with this e-book market, and many authors -- though e-books being an established platform-- often sneer at this surging new medium of publishing. That said, e-books do have certain advantages over their paper-made counterparts. Firstly, e-books offer the flexibility of reading your favorite books without the added weight. You can carry thousands of books in one small device making it much more lucrative for voracious readers. Also, e-books are slightly cheaper than paperbacks, especially on the Amazon Kindle store. So, in short, there’s no doubt that e-books are here to stay in the long run, and who knows, they might completely replace the paperback industry. 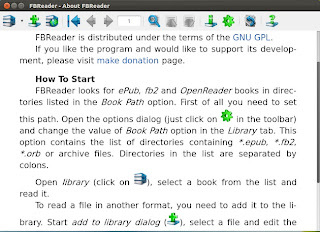 So, if you too are an Ubuntu user like us who loves to read the best books, here are some great software applications that should come in handy. These apps not only allow you to easily read e-books, but also manage them effortlessly. Calibre is more of an e-book management tool than an e-book reader. The free software lets you organize your e-book collection in a nice library along with metadata tagging. For books that don’t have any tags, Calibre also allows you to automatically download the metadata, thus making your library much more organized. Secondly, if you own a Kindle, Nook, or any other popular e-book reader, you can hook it up with Calibre thus allowing you to transfer books from your computer to your device. Furthermore, you can also convert e-books from one format to another. So let’s say you download a PDF book and want to convert it into ePub, you can do that easily by pressing the convert button on the toolbar. Finally, last but not the least, Calibre does serve as a good e-book reader. We have to admit that it’s nothing fancy; however, it does let you read your favorite novel without much distraction. Worth a download if you’re looking for a one-stop solution for your e-book needs. If you’re looking for something simpler though, then simply go for the other tools mentioned on the list. 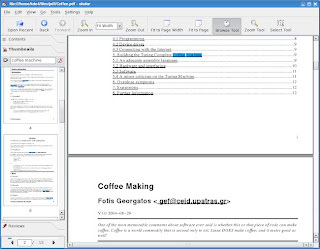 Evince or Document Reader is the default PDF viewer for Ubuntu. Though the application doesn’t have a fancy UI, it does serve as a great e-book-reading tool. Evince supports formats like PDF, DVI, TIFF, DjVu, along with optional support for comics. One of the most interesting features of this application is that it allows you to pick up where you left off. 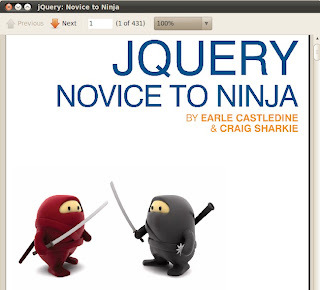 So say you’re on page 32 and you close the e-book, the next time you’ll reopen it, Evince will open the same page. To open Evince on your Ubuntu device, simply fire up the launcher (Super key) and search for ‘Document Viewer’. 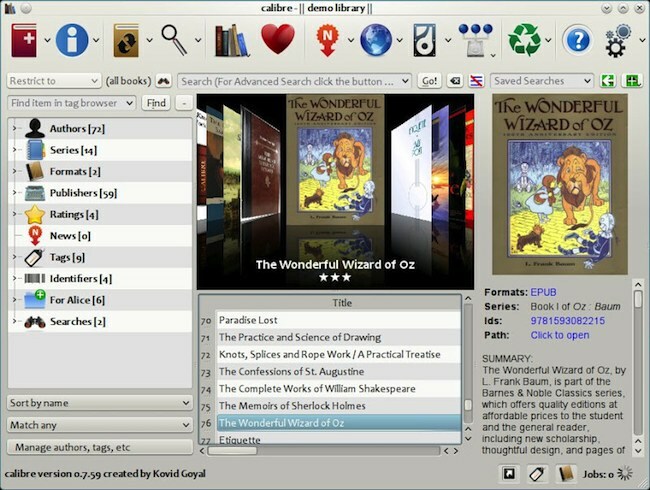 Okular is KDE’s document viewer. Though a document viewer like Evince, you can also use Okular to read e-books. However, much unlike Evince, Okular supports a wide variety of formats. 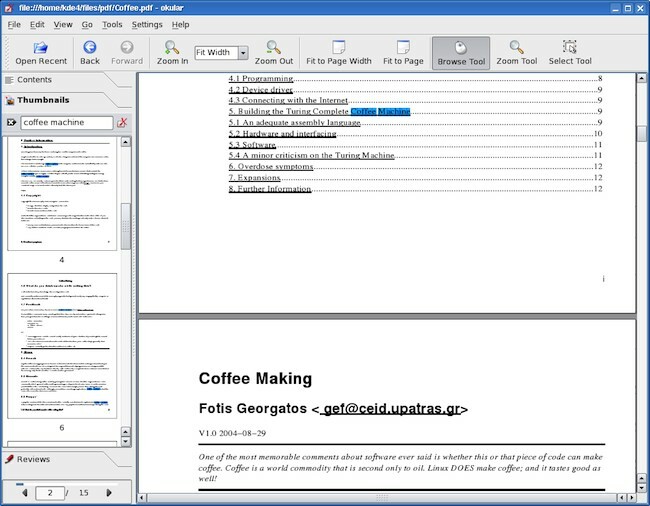 Supported formats include PDF, PS, CHM, ePub, Mobipocket and more. Also, Okular allows you to bookmark, annotate, and underline specific parts of the text making it a great tool for research students. MuPDF is a lightweight PDF reader that can come in handy if you read e-books in PDF format. Other than that this application doesn’t offer many features. 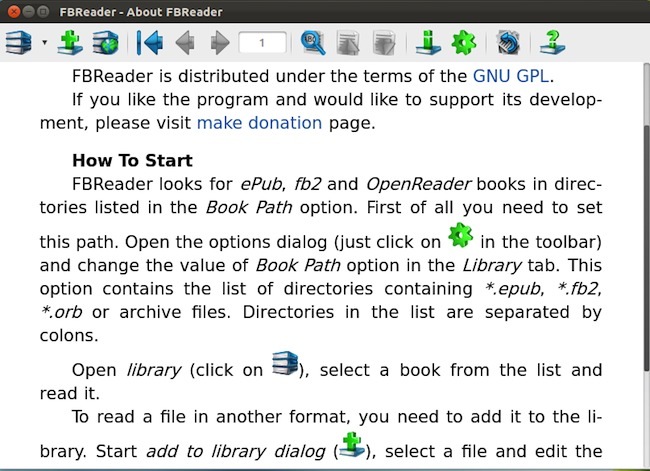 FBReader is a dedicated e-book reader for Ubuntu. It comes with support for a variety of open e-book formats including fb2, CHM, ePub, Mobipocket and more. It also allows you to read files directly from .zip or .tar.gz archives. Despite the unflattering UI, FBReader shines in its ability to display e-books in their full glory. What’s more, you can also search and download books from Feedbooks right from the app. Did you try the CoolReader? That is the best ebook reader out there. It is way faster and responsive than the calibre. 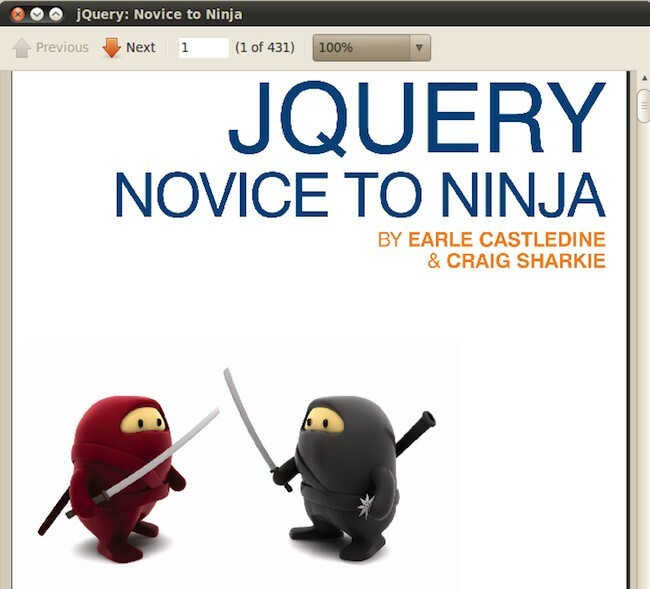 It comes with all the features like dual-pane view mode, css themeing etc. It wins hands down compared to calibre without all those book management (just a wastage) additions. If you install calibre, it comes with a very lightweight ebook reader. 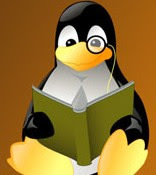 Just launch "ebook-viewer" from your command line.